To say these evolving developments could provide silver's price with levitation may be an understatement. Obviously, they've run out of plunder in London. Whether the Shanghai exchange will line their purses likewise, we'll have to see. ETF Securities Ltd., an exchange-traded-products provider with about $19 billion of assets, proposed an alternative to the century-old London silver fixing benchmark process that’s set to end in August. 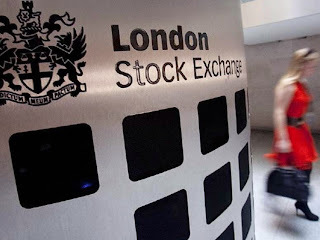 The proposal made to the London Bullion Market Association would use a five-minute auction process that occurs on the London Stock Exchange and based on ETF Securities’ silver-backed fund that trades on the bourse, said Graham Tuckwell, chairman and founder of the Jersey-based company. The company is talking to the LSE about moving the auction capability from 4:30 p.m. to noon, when the present silver fixing process is held, he said. The London Silver Market Fixing Ltd. will stop running the fixing on Aug. 14 after Deutsche Bank AG said it will withdraw from the process, leaving just two banks to conduct the ritual. The LBMA began a consultation in May seeking views for an alternative to the benchmark that’s used by miners to central banks. The London Metal Exchange got requests to provide a daily rate, CME Group Inc. has said it’s also helping to find a way to set prices and Platts said today it’s in talks with the LBMA. Regulatory focus on financial benchmarks is intensifying after rigging was uncovered in everything from interbank lending rates to currencies. Economists and academics have said fixings are susceptible to manipulation and lack sufficient regulation, while traders say the processes are efficient and crucial reference points for the market. Deutsche Bank, HSBC Holdings Plc and Bank of Nova Scotia conduct the silver fixing each day at noon. The German bank said it’s withdrawing from fixings as it scales back its commodities business. It stopped taking part in gold fixings in May after failing to agree on a sale of its seat and postponed its April 29 resignation from the silver rate to Aug. 14. During the silver fix, the three member banks declare how much metal they want to buy or sell for clients as well as their own accounts. Traders relay shifts in supply and demand to clients and take fresh orders as the price changes, before the fix is made. The first silver fixing took place in 1897. Used as a benchmark to price holdings at, the fixing also allows participants to physically buy and sell metal. The proposal made by ETF Securities could allow the transfer of physical metal two days later, Tuckwell said. The LME said May 29 it had requests from industrial and financial companies, has defined a “robust” process for a daily price and is working with the LBMA in consulting with the market. CME Group said that day it’s “working closely with the precious metals industry and LBMA to reduce market disruption by helping to find a robust transaction-based way to set the daily spot price.” An LBMA survey as part of the consolation closed May 30. Silver was fixed at $18.81 an ounce today. The metal for immediate delivery declined 2.5 percent this year, according to Bloomberg generic pricing.